Mitsuba is, as the name indicates, an herb of Japanese extraction (we gather the name means “three leaves”). It is said to have a flavor rather like parsley (which it physically resembles), but somewhat milder (though others say it is like Angelica). One blogger described the taste so: “Subtle. Maybe just a little nutty. Fresh. Maybe a little celery orientation. 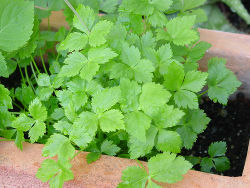 The herb is listed as Japanese Parsley, or Japanese Chervil, so that gives a good hint as to the flavor it imparts to foods.” Though the plant’s stems are cooked in the Orient for special uses (such as tying up sushi rolls), in western cuisine what’s wanted is the leaves—used raw, not cooked into dishes, as cooking destroys the flavor (as with chervil). It is a hardy perennial, and is typically in leaf the year round. It is, however, usually grown as an annual. Seeds are scarce in the U.S., but by no means unfindable. Mitsuba is apparently not fussy about its soil, tolerating extremes of pH and even nutrient-poor conditions. It wants limited sun; too much will turn the leaves yellow. Give it some definite shade, or grow it indoors (it is an excellent candidate for container growing). Direct-seed it fairly early in the season, preferably in a modest-sized container or pot. Chances are it will come up again by itself every year thereafter, whether by survival (it is a perennial) or by re-seeding (which it is said to do freely). Mitsuba wants good watering, though—like most herbs—doesn’t like “wet feet”, so arrange for good drainage. Beware slugs, which seem to like it. Harvest a few leaves as needed. Left uncut, the plant can reach two feet in height. Keep the small, white blossoms trimmed. Note well that to preserve its fragrance, it should never be more than at very most briefly parboiled: add it to cooked dishes just before serving. It was last modified on Monday, 4 February 2019, at 15:32 EST.